Numerous studies have developed and analysed strategies for maximising utility in social dilemmas from both an individual agent’s perspective and more generally from the viewpoint of a society. In this paper we bring this body of work together by investigating the success of a wide range of strategies in environments with varying characteristics, comparing their success. In particular we study within agent-based simulations, different interaction topologies, agents with and without mobility, and strategies with and without adaptation in the form of reinforcement learning, in both competitive and cooperative settings represented by the Prisoner’s Dilemma and the Stag Hunt, respectively. The results of our experiments show that allowing agents mobility decreases the level of cooperation in the society of agents, due to singular interactions with individual opponents that limit the possibility for direct reciprocity. Unstructured environments similarly support a greater number of singular interactions and thus higher levels of defection in the Prisoner’s Dilemma. In the Stag Hunt, strategies that prioritise risk taking show a greater level of success regardless of environment topology. 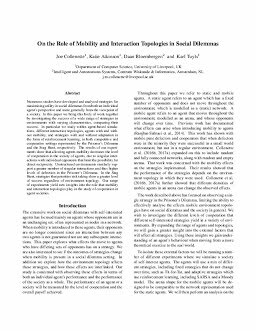 Our range of experiments yield new insights into the role that mobility and interaction topologies play in the study of cooperation in agent societies.